Two doctors and two coaches received the Regents' Meritorious Service Medal in recognition of extraordinary and distinguished service to The University of New Mexico at the December board meeting. The regents honored Dr. Cheryl L. Willman for her scientific and academic leadership in the National Cancer Institute designation of UNM as a Comprehensive Cancer Center, and Dr. Arthur Kaufman for 41 years of outstanding academic and community health leadership at UNM as well as his induction into the National Academy of Medicine. 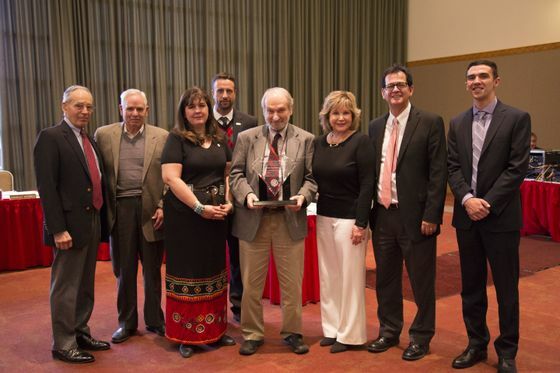 Dr. Arthur Kaufman receiving the 2015 Regents’ Meritorious Service Award.